Burton beers, a traditional hall-mark of great beverages. 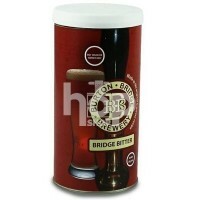 Burton Bridge Brewery takes its name from the Burton Bridge over the meandering River Trent at Burton-on-Trent, and is situated 20 yards from the end of the present bridge. Built in the late 17th Centuary as the Fox and Goose Inn, the old bridge finished just outside the front door. These brews emulate this area famous for its beers which benefitted from the Burton waters high in sulphates and which identified the calcium sulphate content as being responsible for accentuating the clean tasting hop bitterness in Burton Ale. Easy brews achieving quick maturity.